High-waisted straight leg formal trousers in two inseam lengths - a 26' inseam for petites under 5'0 tall and 28' inseam for petites above 5'0 tall. 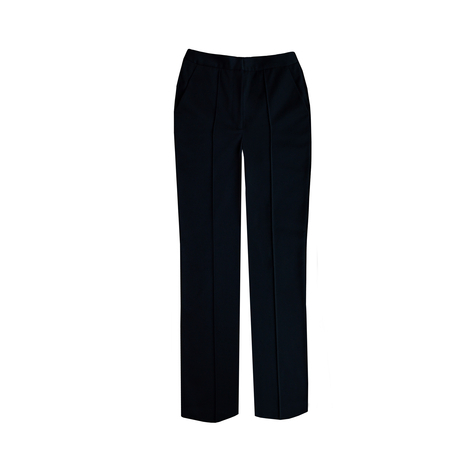 These sharply-cut trousers have an adjustable waist, sewn centre creases at the front, side slant pockets, back welt pockets and they secure to the front with a concealed hook and zip fastening. Our model is 5'1" and is wearing a size 6 trouser with 26 inch inseam. COMMENTS : Very good quality fabric. Nicely cut. Only issue, and this my problem not the garments (! ), is I find them quite neat around the waist however hips etc fit well.